After doing a few of the Consistency Ratings posts (formerly known as Efficiency Ratings), a persistent question kept popping in my head. If you recall, I focused only on elite players when tracking forehands and backhands (Ferrer, Murray, Serena Williams, Sharapova, Nadal), and a pattern started to emerge: rarely did their Consistency Ratings drop below 90% (in related news, every single player I tracked won his/her match. I always did these live, so I might be a lucky charm of sorts). After looking at all that excellence, I started to wonder: what would the Consistency Rating be for a young, up-and-coming player? Jerzy Janowicz, the volatile 22 year-old from Poland, provided a perfect opportunity to answer that question as he was set to face World Number 6 Tomas Berdych in the second round of the Madrid Masters 1000. Janowicz had convincingly beaten Sam Querrey in straight sets the day before, whereas Berdych (last year’s runner-up) had a first round bye and was just starting his participation in the event. Before the match started, I joked that Janowicz’ Backhand Efficiency Rating would probably lie somewhere around 70%. Through most of 2013, it’s been that shot that has let the young Pole down. And, to be honest, I actually didn’t expect that much better from Janowicz’ forehand, either. Janowicz Forehand Consistency Ratings per set: 89%, 79%, 92%. Janowicz Backhand Consistency Ratings per set: 89%, 93%, 81%. Here you see the consistency roller coaster that all young players go through. Janowicz didn’t play a poor match at all: if anything, he showed flashes of his Paris 2012 form for long stretches. But you can see that he still doesn’t have a wing on which he can really anchor his game, in the way that Serena Williams and Maria Sharapova anchor their baseline game on their backhands. As we know, Janowicz is very aggressive with both his forehand and his backhand, but either wing can leak errors at any given time. I was amazed at the low volume of groundstrokes Janowicz hit in this match. To play a tiebreaker set and hit fewer than 100 groundstrokes is simply remarkable (remember, I don’t count 1st serve returns or smashes). As a comparison, Janowicz hit fewer groundstrokes in this entire three set match than Andy Murray hit just in the third set of the Miami final. Of course, a big part of this outcome is the fact that Janowicz was playing a fellow big server/hitter in Tomas Berdych. In addition to that, Janowicz is far from being a great returner of serve. This is why you see that in that entire third set (and only once in the whole match) did Janowicz have to hit 10 or more forehands or backhands in any given game. The points were ending very quickly. – Janowicz hit more forehands than backhands in Sets 1 and 2, but not in Set 3. 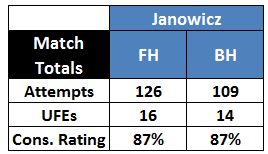 – Janowicz hit almost twice as many forehands than backhands during his own service games in Sets 1 and 2. – Throughout the match, Janowicz only hit more than 2 unforced errors in a single game once. It happened in the last game of the match, in which Berdych broke serve once again to close out the match. Regardless, I think it’s encouraging for Janowicz that while he’s obviously prone to ups and downs with his groundstrokes, he’s close to the levels that are needed to be part of the elite. After all, he did finish with Consistency Ratings of 87% on both wings. Watching this match I was reminded once again of just how raw a talent Janowicz is. Sometimes he makes simple court positioning mistakes that are more appropriate for an 18 year old than a 22 year old. Progress will come with time and experience. For all intents and purposes, it’s probably better to think of Jerzy Janowicz as a promising 18 or 19 year old, instead of a 22 year old. The Pole has only played 55 ATP main draw matches, and his rise to his current ranking of #24 was absolutely meteoric due to his Paris run. I think 2013 won’t see him climb much further up the rankings, but that’s more than fine. This is just his first full season on the ATP tour (as a comparison, Janowicz is having the type of season Novak Djokovic had in 2006). But once Jerzy has two full season on the tour, I would expect to see him close to or inside the elite of the sport. There’s just way too much talent there for that not to happen. That much was evident yesterday. Great analysis. However, Scorpios rarely succeed at the highest level. Dolgo, verdasco, falla and Jerzy make up the only 4 Scorpios currently in the top 100. Just 4. Emerson, Rosewall, Becker had success, but that was a while ago. This summer I’d be interested in contributing a piece on astrology and the breakdown of the signs and their recent success. ..
Hope Changeover takes you up on that offer Scott. I for one would be very interested.